One of the most common complaints that frequent moviegoers have is the tendency for trailers to cram every single plot development into a three-minute promo, essentially turning the trailer into a Reader’s Digest condensed version of the film itself. Having seen the trailer, potential viewers presumably will derive some degree of comfort in knowing exactly what’s going to happen in the next scene. Well, the good news is that the new Matthew McConaughey/Anne Hathaway thriller Serenity is not a tropical version of Body Heat as implied by its trailer. The bad news is that it’s much, much, much, much worse. I’m considerably hamstrung in my ability to synopsize Serenity because to do so accurately would definitely spoil it for the 20% or so of potential viewers who, based on surveys of actual attendees, seem to have enjoyed the twist so far. So, here goes. 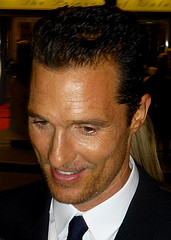 The film takes place somewhere in the Caribbean where Baker Dill (Matthew McConaughey) makes a living of sorts operating a charter boat called Serenity. By day, he and his occasional first mate Duke (Djimon Hounsou) take wealthy tourists out in search of trophy catches. Unfortunately, Baker isn’t much of a businessman, since he often gets sidetracked by his quest for a giant tuna that he calls Justice, and his chasing after the fish in the middle of charter excursions results in a lot of peeved tourists. Since Baker’s charter business doesn’t bring in enough to pay the bills, he supplements his income by bedding a well-to-do older woman, Constance (Diane Lane), who pays him for his services. Any noir needs a femme fatale, so enter Karen Zariakis (a blonde Anne Hathaway channeling Virginia Lake), wife of multi-millionaire and all-around sleazeball Frank Zariakis (Jason Clarke). Frank is the kind of guy who makes his wife strip while he inspects her body to see if she has any scratches that might indicate she’s fooling around, then giving her lots more scratches by beating with his belt. Karen happens to be Baker’s ex-wife, who took his son and left him a few years back to be with Frank. Now, she feels terrible about it (in more ways than one), so she offers Baker ten million dollars to take Frank out on a one-way fishing trip. She also offers herself in the bargain to seal the deal. 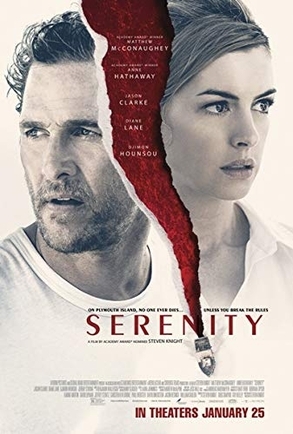 For the first two-thirds of its running time, Serenity plays pretty much as this synopsis sounds and as the trailer implies—a sunbaked, tropical noir with Matthew McConaughey as the sad sack protagonist in over his head. True, there are a few disparate elements such as some props that don’t seem to fit and references to Baker Dill’s son, with whom he may have a psychic connection. And, most bizarre of all is a guy in a very uncomfortable looking dark suit who keeps chasing after and just missing Baker for most of that early part of the movie. Frankly, these disparate elements were annoying and distracting, but I would have been willing to chalk them up to misguided attempts at humor and intrigue if the film’s payoff was good enough. Sadly, it wasn’t. That payoff isn’t a single moment of recognition like Bruce Willis had at the end of The Sixth Sense or Chazz Palminteri experienced in The Usual Suspects. Instead, it’s a lengthy confrontation between Baker and the above-mentioned guy in the dark suit, at the end of which, for me at least, everything made sense, at least on the movie’s own bizarre level. However, Serenity goes on for another half hour after that reveal, and the film gets more ridiculous by the minute. Since I don’t want to spoil the ending for those who actually intend to see the movie, I can’t really go into more detail. I can say that it is the worst type of trick ending, one that essentially tells the audience that their attempts to make sense out of and follow the early parts of the story were completely wasted, and, moreover, that the entire venture is an exercise by a writer/director who fancies himself smarter than the audience. That writer/director is Steven Knight, someone who, up until this disastrous misstep had an excellent record, having created the television series Peaky Blinders and written screenplays for Eastern Promises, Locke (which he also directed), and Dirty Pretty Things (for which he got an Oscar nomination). So, Knight knows what he’s doing; he just had an incredibly wrong-headed idea for an “out-of-the-box” movie. While the bulk of the blame for the abject failure of Serenity should go to the script, the cast members are not faultless either. Matthew McConaughey and Anne Hathaway have both won Oscars, but they are overplaying their roles here, and the results are some scenes that are unintentionally ludicrous, especially the obligatory seduction scene, which by all rights should have been a slam dunk. Indeed, the only cast member who really feels at ease here is Diane Lane, perhaps because her role is rather one note. In fairness to the film’s stars, their amateurish portrayals may well have been the result of some misguided direction for reasons that become obvious once the audience learns about the film’s big twist. The only movie that I can recall that was similar to Serenity in recent years was Darren Aronofsky’s mother!, another film with a very talented cast and a completely gonzo storyline. At least, Serenity makes sense on its own level, while mother! gave in entirely to excess. In both cases, it took real talent behind the camera to make something so completely off track. This type of spectacular incompetence is very likely to be rewarded come Razzie Awards time. For now, however, audiences can best maintain their serenity by giving Serenity a wide berth. In this clip, Diane Lane reimburses Matthew McConaughey for spending time with her.